Board-certified cosmetic surgeon and founder of North Shore Center for Facial Plastic & Cosmetic Surgery, Dr. Anthony Geroulis was named a Top 10 Doc, placing him in the top 1% of the active physicians in the United States, according to Vitals. Board-certified facial cosmetic surgeon Dr. Anthony Geroulis has been honored with a Top 10 Doctor Award. 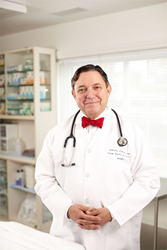 This notable accolade distinguishes Dr. Geroulis as among the top 1% of the nearly 900,000 doctors who are actively practicing medicine in the United States. These annual awards are determined through a compilation of patient feedback regarding follow-up protocol, bedside manner and quality and quantity of face time with the doctor. For more information about Dr. Geroulis and his fully accredited AAAHC facility, North Shore Center for Facial Plastic & Cosmetic Surgery, please visit http://www.geroulis.com or call 866.875.3937. Bringing over 33 years of surgical and artistic experience to the field of facial plastic & cosmetic surgery, Anthony J. Geroulis, MD, FICS, has repeatedly been named a “Top Doctor” by U.S. News & World Report. Board certified in cosmetic surgery, author and active sculptor, Dr. Anthony Geroulis is a clinical professor of surgery at University of Chicago Medicine. His practice is headquartered in Northfield, with offices in Chicago, at University of Chicago Medicine and at St. Alexius Medical Center in Hoffman Estates.